Like it or not chances are every amazing photograph you have ever seen or marvelled ever since the birth of photography itself has had some form of editing! Hey but wait they didn’t have photoshop and lightroom in all those years ago? I hear you say, that is true but a lot of the tools you see in lightroom, even the fact it is called a digital ‘darkroom’ is a nod to a time when if you wanted to edit a photo at home you were usually hunched up in the basement or under the stairs breathing in a whole cocktail of chemicals after doing a bit of dodging and burning! Thankfully it is so much simpler to edit our photos these days. So now you have a bit of background, enjoy these 3 easy steps to improve your raw editing skills! This is such a great way to learn whilst a the same time getting valuable, positive and constructive feedback – rather than people just giving harsh criticism without ever showing their photography skills (And believe me this happens!) This will enable you to keep progressing and getting better at editing your raw files, and learn to shape them into the photos you always imaged them to be! If you don’t have a camera that can shoot in the raw format – or even if you do but just want to have a shot at editing someone else’s raw file, then find a resource were you can download a free raw file. Jared Polin, learningcameras.com and several other photographers including myself (link in step2) that offer up our raw files for edit. This will help you get another photographers viewpoint so at the same time of learning editing skills you will be getting a fellow photographers perspective which will show you another way to look at photography, composition and lighting. See what settings they used and start to de-construct the image. You can then start to apply certain elements you like to your own photography and start trying out new techniques. Absorb and take on board the information given to you. Like the way a fellow photographer editing his image? Why not ask him! We are all friends here and help each other learn and progress. To us this is what the group and idea is built on. And once you start getting more confident you can start to help other photographers wanting to improve their skills. Read underneath how to find us and how to get editing our FREE monthly raw file in our #scoretheraw raw editing competition! 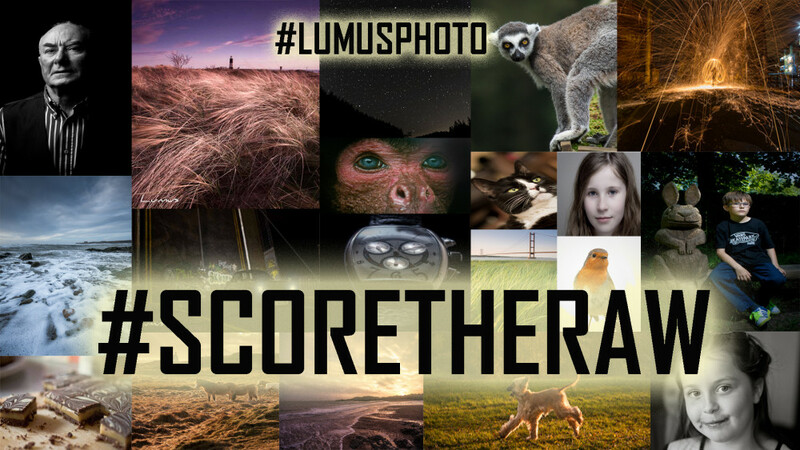 #scoretheraw is the new name of the raw editing challenge in the lumusphoto community. Each month a new raw file will be put up for members of the community to sink their editing teeth into. Once you have finished your edit post the picture up in the community and on your social media pages with the hashtag #scoretheraw. Then together as a community we pick a winner by scoring the raw edits out of ten with helpful critique helping us to learn new editing methods and techniques along the way! It’s a great way to meet other photographers, share ideas, opinions and ideas! So what are you waiting for? Head over to lumusphoto’s ‘NO SNOBBERY’ photography group and start editing! If you are still struggling with your raw editing check out learnphotoediting.net for really cool tutorials which will blow you away!